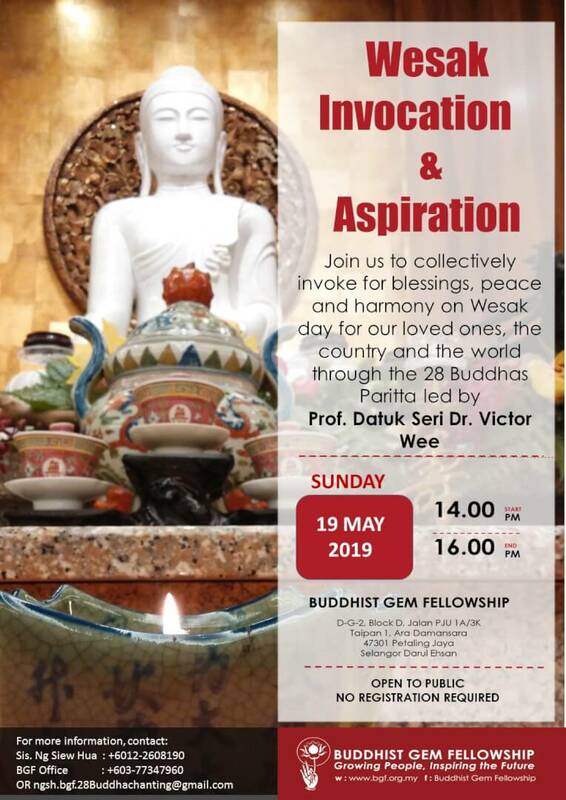 Buddhist Gem Fellowship welcomes all to participate in the auspicious Wesak Chanting of 28 Buddhas and Victory Stanzas (Invocation and Aspiration – I&A) to collectively invoke for blessings, peace and harmony for our loved ones, the country and the world and to reaffirm our faith in the Triple Gem. Chanting of Protective Verses has been a devotional practice by Buddhists over the centuries to generate merits and invoke for blessings and protection. Recitals with confidence in the truth of the Buddha’s words can help to heal and induce positive mental attitude that brings happiness (Ven.Maha Thera Piyadassi 1975). The 2-hr Chanting of 28 Buddhas and Victory Stanzas is led by Datuk Seri Dr. Victor Wee. Please bring along your mala beads. Venue: Shrine Hall, BGF Ara Damansara, D-G-2, Block D, Jln PJU 1A/3K, Taipan 1, Ara Damansara, PJ Selangor.